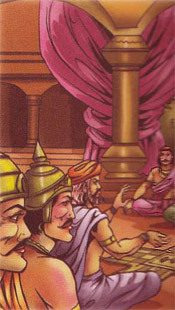 Shakuni was Duryodhana's wicked uncle who had helped the Kauravas win the Pandavas' half of the kingdom from them in a game of the dice, and sent them into exile. He was very cunning and devious. On the sixteenth day of the battle of Kurukshetra, a fierce fight was going on between Nakula and Shakuni. Shakuni was a brave warrior and he was overpowering Nakula, when Nakula's brother, Sahadeva, came to his rescue. He shot an arrow at Shakuni saying, "It is your evil mind and numerous sins that have led to this war. Now face your doom." The arrow cut Shakuni's head off. After Shakuni's death. Duryodhana was left all alone. He did not even have Karna to support him. Duryodhana realised that his end was also near and was sad and broken hearted.